Received: October 9, 2016; Revised: November 8, 2016; Accepted: January 17, 2017; Published online: June 22, 2017. A 32-year-old male presented with a history of intermittent fever, chills, and 6-kg weight loss over six months. Upon physical examination, he had conjunctival icterus and the maximum body temperature was 40℃. Hemograms showed pancytopenia: hemoglobin, 7.9 g/dL; total leukocyte count (TLC), 1.4×109/L; absolute neutrophil count, 1.2×109/L; and platelet count, 40×109/L. Liver function test revealed: aspartate transaminase, 52 U/L; alanine transaminase, 62 U/L; alkaline phosphatase, 71 U/L; and total bilirubin, 1.3 mg/dL (conjugated bilirubin, 0.72 mg/dL). C-reactive protein concentration was 44 mg/L. Abdominal ultrasonography confirmed hepatosplenomegaly. Bone marrow examination revealed lots of histiocytes phagocytosing red blood cells, erythroblasts, and platelets along with many intrahistiocytic and extracellular Histoplasma capsulatum (A-D; May-Grunwald-Giemsa, ×1,000). Serum ferritin was elevated (3,339 µg/L) and severe hypofibrinogenemia was noted. Bone marrow examination and laboratory findings indicated hemophagocytic lymphohistiocytosis (HLH) secondary to histoplasmosis. The patient have not recently traveled to Histoplasma-endemic areas and was HIV-negative. He was treated with intravenous amphotericin B (1 mg/kg) for 2 weeks. His fever subsided in two days and his peripheral blood counts started improving by the sixth day of treatment (day 6: hemoglobin, 10 g/dL; platelet count, 90×109/L; TLC, 3.9×109/L). Histoplasmosis has been reported mostly from eastern and southern regions of India, however, the patient was a resident of north India (Punjab). 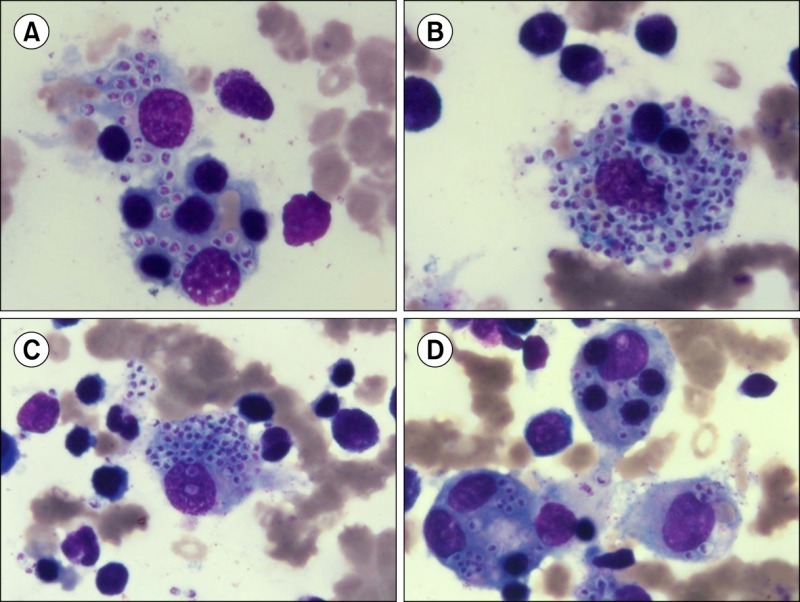 Histoplasmosis-triggered HLH in this patient who was HIV-negative and from a non-endemic region of Histoplasma is therefore very unusual.